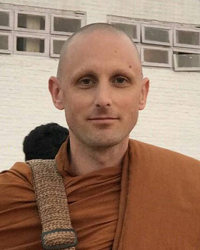 Ajahn Nyaniko was born and raised in California. In 2002, he took novice ordination, and in July 2003 he ordained as a bhikkhu. He received his basic training from Luang Por Pasanno and Luang Por Amaro at Abhayagiri, and has also spent over 6 years training in Thailand. View Ajahn Nyaniko's upcoming programs.